Scanning transmission electron micrograph (left) and structural model (right) for an ordered, nanostructured, rhombohedral phase, SrCrO2.8 showing oxygen-deficient SrO2 planes, which enable facile oxygen anion diffusion at low temperature. Brighter spheres are strontium ions; less-bright spheres are chromium ions. Oxygen anions are barely visible, and oxygen vacancies appear as black. Enlarge Image. Results: Researchers have been trying to increase the efficiency of solid oxide fuel cells by lowering the temperatures at which they run. More efficient fuel cells might gain wider use in vehicles or as quiet, pollution-free, neighborhood electricity generating stations. A serendipitous finding has resulted in a semiconducting material that could enable fuel cells to operate at temperatures two-thirds lower than current technology, scientists reported August 18 in Nature Communications. In an attempt to create a metal oxide with the properties of metal, researchers at Pacific Northwest National Laboratory created a new form of the metal oxide. This particular strontium-chromium oxide performs as a semiconductor, or a material whose ability to conduct electricity can be turned on and off. It also allows oxygen to diffuse easily, a requirement for a solid oxide fuel cell. Best yet, it allows diffusion at a temperature that can lead to much more efficient fuel cells. Why It Matters: Energy researchers need improved materials to make fuel cells more widely used. Solid oxide fuel cells require oxides capable of absorbing and transmitting negatively charged oxygen atoms at low temperatures. Current materials require temperatures around 800 degrees Celsius (for reference, car engines run at about 200 degrees Celsius and steel melts around 1500). Method: Researchers at PNNL were trying to make strontium chromium oxide in a kind of crystalline form called perovskite, which has many useful electronic properties. In this material, the strontium, chromium and oxygen atoms stack together in a cube. The metal atoms — strontium and chromium — bond completely to the oxygen atoms around them. However, in the material that formed, the strontium chromium oxide packed into a rhombus-shaped crystal — think diamond — and many of the oxygen atoms were missing. What's more, the holes where the oxygen atoms had been, also called oxygen vacancies, had come together to form well-defined planes within the new crystal structure. The researchers found that these planes act as channels that allow oxygen from outside the material to diffuse through the material at an exceptionally low temperature for these materials, about 250 degrees Celsius. "At high enough concentrations, oxygen vacancies aggregate and form new mesoscale structures with novel properties that the original material doesn't have," said PNNL materials scientist Dr. Scott Chambers, who led the research. "In this case, the mesoscale crystalline structure transmits oxygen very efficiently." The scientists inadvertently generated the material by taking advantage of the natural tendency of chromium atoms to avoid certain bonding environments. 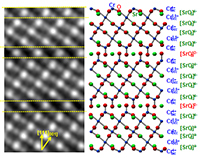 They found that their attempts to make metallic SrCrO3 (strontium chromium oxide in a ratio of 1:1:3) lead instead to the formation of semiconducting SrCrO2.8 (with a ratio of 1:1:2.8). 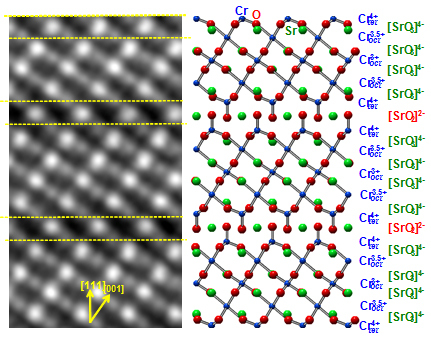 Because chromium as an ion with a charge of +4 does not like to form 90 degree bonds with oxygen, as it must in SrCrO3, SrCrO2.8 forms instead with a completely different crystal structure. This material contains oxygen-deficient regions through which oxygen can diffuse very easily. Those regions might provide a way to take better advantage of the material's electronic properties. "As an additional benefit, ordered arrays of oxygen vacancies might allow us to separate the material's electronic and thermal properties," said Chambers. "This would help us improve the performance of thermoelectrics, in either generating power from heat or for use in refrigeration." The team made ultra-pure crystalline films of the new material and used instruments and expertise at EMSL to understand the material's properties. A DOE Office of Science User Facility, EMSL scientists worked with Chambers to develop a new instrument called an oxygen-assisted molecular beam epitaxy deposition system that is specifically designed to make and study these kinds of crystalline films. What’s Next? In the future, the team plans to apply the understanding gained to other materials, such as the deposition, characterization, and understanding of epitaxial strontium-doped lanthanum chromite, which has potential importance in visible light harvesting. In the long term, the team plans to exploit the observed phenomenon to carry out nanofabrication of novel heterogeneous catalytic structures by depositing submonolayer quantities of catalytically important metals on the surface of rhombus-shaped, semiconducting oxide, and using the intersection of the defect planes with the free surface to order the incoming metal atoms into nanowires. Sponsors: This work was supported by the U.S. Department of Energy, Office of Science, Office of Basic Energy Sciences, Division of Materials Sciences and Engineering (HZ, YD, PS, MB, RC, SC) and the William R. Wiley EMSL postdoctoral fellowship (RC). The computational work done by Peter Sushko was also supported in part by the PNNL Laboratory Directed Research and Development program. Research Team: Hongliang Zhang, Yingge Du, Peter Sushko, Mark Bowden, Robert Colby, and Scott Chambers, PNNL. Reference: Zhang H, Y Du, PV Sushko, ME Bowden, RJ Colby, and SA Chambers. 2014. "Reversible Nano-Structuring of SrCrO3-δ Through Oxidization and Reduction at Low Temperatures." Nature Communications 5, Article number 4669. DOI: 10.1038/ncomms5669.